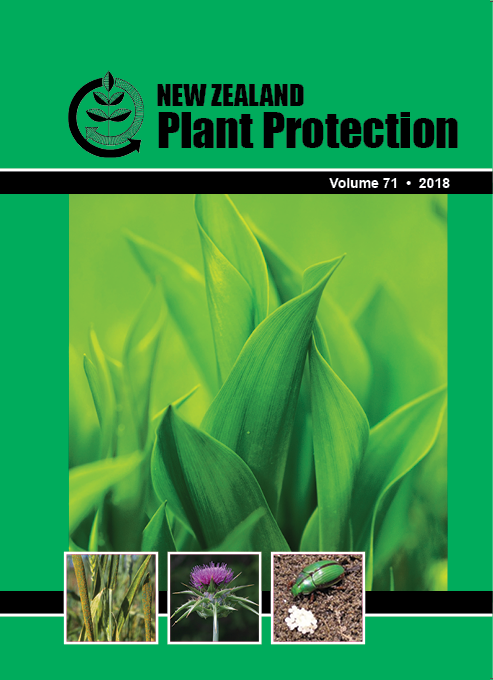 Velvetleaf (Abutilon theophrasti) was accidentally introduced into New Zealand in 2016 and intensive efforts are being implemented to mitigate the risk of its naturalisation. This study investigated the possibility of velvetleaf plants surviving in maize fields following silage harvest in late summer and early autumn. Velvetleaf plants were grown to maturity in a glasshouse during the summer of 2017—2018. They were left to seed and senesce naturally and, on 28 February 2018, five senesced plants were “harvested” at each height (0, 30, 50, 70 and 150 mm) with varying numbers of leaf nodes remaining (0, 0, 1, 2 and 3 pairs respectively). Velvetleaf was capable of regeneration 2—4 weeks after “harvest” from these leaf nodes. Forty percent regeneration occurred with 1 pair of nodes; 80% (2 pairs); and 100% (3 pairs). All regenerated plants subsequently produced mature seed pods with viable seed (95% germination) 6—10 weeks following “harvest”. Maize silage crops are normally cut ~100 mm above ground level. In this study, velvetleaf was able to regenerate and reproduce following simulated maize silage harvest at, below and above, normal cutting height. Growers are advised to continue management strategies for velvetleaf to prevent seed set following maize silage harvest and before sowing of the next crop or pasture.